Recently, an artist buddy and I went on the White Rock Artist Studio Tour to see how others organize their work space to inspire us to make our studios more efficient. Before we ventured out, we made some mental notes of what we wanted to pay attention to so that we could learn how to make our studios better. One of the things we were both interested in was art supply organization, so whenever we saw something that would make life easier, we pointed it out to each other. 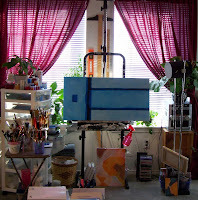 Two weeks after our artist studio tour & research outing I decided to re-organize my supplies. This ended up being a day long project, because the last time I had done anything like that was in 2003 when I decided to clear out my furniture and turn my living room into a studio. Going through everything was actually fun and interesting. I found a lot of stuff that I wasn’t using and wasn’t intending to use any time soon, so I put those items in a box and will be giving them to some artists this week. This will help somebody else do something beautiful and it has helped me to de-clutter my studio some. Spare bedroom - Sell the extra bed and get an air mattress for guests…you can use the extra $$ to buy art supplies…besides, how often do you have slumber parties? Storage Shed in the backyard - Don’t forget the window unit…. Dining Room - You only use twice a year for family meals anyway. And as an added perk, as long as your studio is NOT in your bedroom you can write off the square footage of it for business expense. Woohoo! Organizing your studio doesn’t have to be a difficulat task. We saw how one artist was using an old plastic closet door shoe organizer to keep different supplies in, but instead of hanging it on a door, she nailed it to her studio wall. One lady had all of her stuff in an old tool chest with wheels so that she could roll it wherever she needed it. Another artist had her work table suspended on the ceiling via pulley system to make more room in her studio for other things. When she needs to work on the table, she simply clears the area and cranks the handle to lower the table. You don’t have to spend an arm and leg either…you can find great deals on storage cabinets, carts, shelving units, containers, etc. at garage sales, estate sales, going out of business sales, thrift stores, holiday sales, etc. By having a special creative space, you’ll also be encouraged to create more frequently. For me, since my studio is such a large portion of my residence, I constantly see paintings that are in progress and it sparks ideas for new work, helps me with creative problem solving in pieces that have me “stumped” and keeps me focused on my short and long term artistic goals. If you don’t have a studio space, now may be a good time to create one and bless yourself with a special place that’s set aside for your creative endeavors. If you have a studio, now may be a good time to go through things and take inventory of what you have and move things around so that your space is more efficient than before. You may decide to bless other artists with things you don’t use/need OR you may want to donate them to a homeless shelter, church, or school for kids to use. Either way, it’s all good, so have fun and enjoy the process of making your studio unique, inspiring, and one of the coolest places to hangout in your neighborhood!